If you like to escape from the bustle of the Vinschgau, I recommend you to bike into the Matschertal (Val di Mazia in Italian), which has hardly been discovered by tourists. The climb begins where the road to Matsch branches off from the main road through the Vinschgau, near Tartsch. 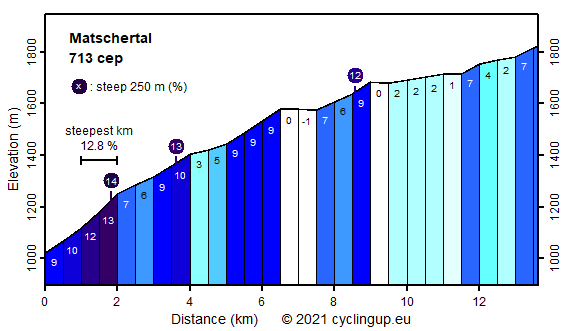 The first two kilometers are really steep (9-13%), with a steepest interval of one kilometer of 12.8%, but having finished this part, the worst is already over. There is ample opportunity to enjoy the view of the valley (Vinschgau) and the mountains west of it. The next 4.5 kilometers to Matsch the slope varies between 3 and 10%. The last one and a half kilometers before Matsch are the hardest (9% on average). From Matsch you should follow the signs "Glieshof". There is a quick alternation of easy and steep sections. The steep ones are too short to really hurt. Here it is really nice in the secluded valley with mountains all around. The ride ends at the Glieshof. Note the poor road surface during the descent, as well as the Ortler (3905 m), which now lies ahead.